The Victoria Stadium, set against the Rock of Gibraltar. “YOU CAN UNDERSTAND why they fight over it”, said the Irish fan sitting beside The42 as our plane dipped to bring the Rock of Gibraltar into view. Britain may only now be coming to terms with the loss of their empire, but they are at least invading most conversations these days. The squabble over Gibraltar is between Britain and Spain, and we doubt that Ireland would have much interest in its massive limestone protuberance anyway. Such an ostentatious display of sedimentary rock is a poor metaphor for our relationship with our own history; whereas Gibraltar is happy to show off this millenia-spanning collection of past events, our history is an altogether more reserved affair, lurking in strange and quiet places. Like, as it turns out, Declan Rice’s Instagram. The42 landed to a statement made by Rice, meaning we had to reverse-engineer the apology to discover he had posted “Up the Ra! Wait ‘til we draw England” back in 2015. Rice said his comments were “naive”, while Gareth Southgate called the surfacing of the comments prior to Rice’s England debut “uncanny”. This was a Freudian slip in a very real way from Gareth, given it was ol’ Sigmund who defined the uncanny as “strangely familiar”, which he derived from his belief in the “double”. The idea is a good fit for Rice, who has by the age of 20 lived the full-throated patriotism of fully two different national identities. The realities of Gibraltar’s identity is evident as soon as you leave the airport. Spain is literally within walking distance; otherwise, turn left for Gibraltar, and walk down Winston Churchill Way. It runs perpendicular to the airport’s runway, meaning the airstrip is the first The42 has seen that simultaneously works as a level-crossing. Handily our AirBnb was only a 20-minute walk from the airport, the only slight downside being the fact we had to stay in it. The hallways were straight out of Barton Fink: narrow, dimly-lit and laid with a grimy red carpet on which each stain told a story that nobody really needs to hear. Meanwhile, the television’s only channels were all four ITVs, making it a long way to come to watch some Tipping Point. Still, the fact a guy can amble down Winston Churchill Way and then watch seven-straight hours of Miss Marple is a sign of how classical British emblems festoon the place. It’s different overhead: gaze upward and away from the rock and the place looks like a typical Spanish seaside resort. The skyline is a bar chart of high-rise apartment blocks with barred verandas and shabby shutters, looking down on a scattering of red and apricot terracotta roofs. On the ground, however, it’s been made distinctly British. Red phone boxes are dotted around the streets, while there are numerous memorials to fallen British soldiers engirdling Grand Casemates Square. Said square is yet to be invaded by Irish fans, with many choosing to linger longer in Malaga before arriving for the game. Just as in Ireland, Brexit is dominating the news cycle here, with Gibraltar’s Chief Minister Fabian Picardo yesterday calling on the British government to revoke Article 50 and “take back control” of Brexit. 96% of Gibraltar voted in favour of Remain, but they are in a uniquely complex situation as they also want to remain tied to the UK. A referendum in 2002 to thrust Gibraltar into shared sovereignty between the UK and Spain was defeated by 98.97%. So while Picardo wants the UK to remain in the EU, he has also had to assert Gibraltar’s right to stay with the UK. He responded to the prospect of an EU-backed Spain renewing its claim on Gibraltar by saying that for all their “sticks and stones”, it won’t change Gibraltar’s relationship with the UK. The fact Gibraltar shares a border with the EU means that locals understand the talk of backstops, with a local journalist telling The42 that “we were expecting to be the backstop, rather than Ireland. Amid all the uncertainty, this remoaning column has shown solidarity with the 96% and published this using the EU’s friendly roaming charges rather than the AirBnb WiFi. There is another union in the news, with The42 touching down on what was the 50th anniversary of John Lennon and Yoko Ono’s wedding on the peninsula. Unlike Mr and Mrs Drummond, Mick McCarthy isn’t in Gibraltar for either. He’ll take three points and, ideally, a few goals, but he may find the conditions as challenging as the opposition tomorrow night. 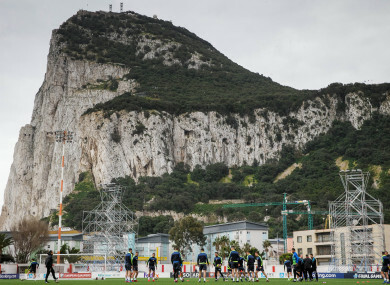 While much has been made of the artificial pitch – none of it, it must be said, by the manager – it is ferociously windy, with the 2,300-capacity Victoria Stadium sitting by the airport runway and at the base of the Rock. While there are stands running alongside the length of the pitch, there is no seating behind either goal. Instead, there’s an ‘Airport End’ and a ‘Rock End’, the latter a pretty spectacular sight. McCarthy’s team should eventually make light of all of this, though, and by Saturday night the football teams should be comfortably separated. Ireland and Gibraltar, however, are two places united by anxiety as to what happens next. Email “Letter from Gibraltar: Brexit, Backstops, Declan Rice and Barton Fink”. Feedback on “Letter from Gibraltar: Brexit, Backstops, Declan Rice and Barton Fink”.